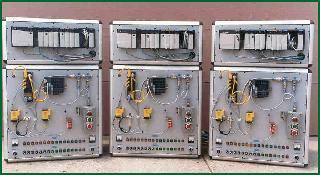 The following pictures represent a sampling of the type of Automation System projects that RTC has designed and manufactured. ControlLogix Training Workstations mounted to the top of an Operator Interface box containing I/O switches and lights, photo eyes, distributed I/O and pneumatics. This system runs on a DeviceNet network. Identical ControlLogix Training Workstations as shown above with a PanelView PV1000C monitor system added. 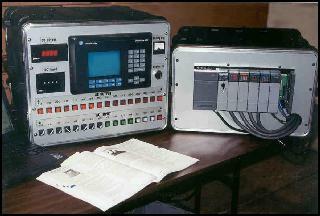 Desktop/portable Training Workstations featuring a processor box with a SLC500 and an Operator Interface box with I/O lights, pushbuttons, selector switches, along with digital and analog I/O. This unit also features a PanelView 600. All Processor and Operator Interface boxes can be custom configured to your specifications. 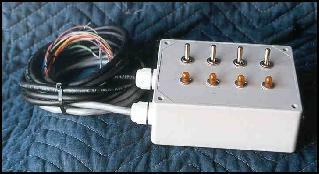 Switchbox featuring four switches and four indicator lights. This unit was designed to communicate over a DeviceNet network.